Remember the ledges in TR3 that you can only see when Lara lights a flare, or if a flame reveals them? Well, you can have 'em! Make your ledges between rooms as normal and light your rooms. When that's done texture your ledges on all sides, including top and bottom, with doublesided and transparent on. At this stage the ledges will show because of the room lighting. Now place an effects lightbulb on all six faces of your ledge (all the sides and top and bottom) but instead of increasing the effects bulb lighting, decrease it to a minus value until you get the right result (this may take some tweaking). 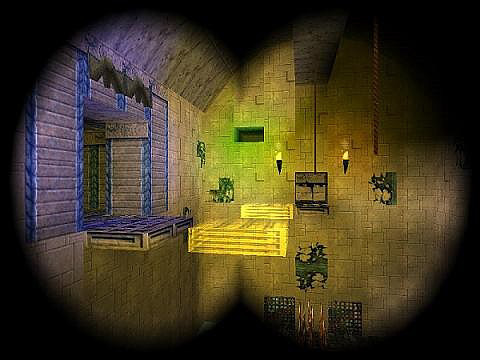 In game the ledges will be invisible, but a flare or flame will illuminate them as invisible blocks just as in TR3.